Reonomy, the data platform that helps real estate investors find their next deal, launched three years ago in New York. Now, after more than 18 months of research and development, the platform goes national. The company raised more than $22 million from investors such as Bain Capital and SoftBank Capital. The hard work paid off. The platform currently features property data points for over 3,000 counties, including building owner contact information, sales history, zoning information, building use and debt history. Customers include JLL, Marcus & Millichap, Cushman & Wakefield, and Coldwell Banker Commercial. The Reonomy data engine offers over 45 million commercial properties nationwide, to a targeted lead list, in seconds. It also allows you to identify comparables and build owner and lender portfolios. You can also create data visualization reports. Because New York City is a different animal, Reonomy offers two different versions of its platform on its website. According to Forbes, NYC has certain “deeper” data sets and functionality, including advanced features such as the ability to export property data. By the end of this year, the company plans on merging the New York and national platforms into one comprehensive product. Reonomy responded to the challenge of navigating and managing commercial real estate markets in the old-school manner: using different, unrelated processes and tools (some digital, some manual). The result often was disappointing, chaotic and confusing. 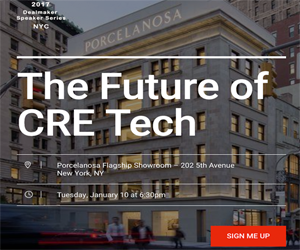 Using industry vets, data scientists, and designers, the Reonomy platform streamlined CRE intelligence to make it more comprehensive, correct and valuable. The result: finding dependable data patterns and strict, repeatable validation steps. Reonomy runs validation algorithms and continually enhanced processes across public data to ensure high-quality information. A property’s ownership history sets the stage for shrewd brokers to locate potential opportunities before they go on the market, says the Reonomy website blog. The blog goes on to say that, by examining the sales history of a property, its current mortgage maturity date, and its owner’s debt history, a broker can anticipate off-market deals and thereby establish a significant advantage over their competition. If, for instance, a certain owner is already carrying a substantial amount of debt as one of their mortgages approaches maturity, they might be willing to part with the asset even if it’s not officially listed. Pinpointing these kinds of “hidden” deals is a game-changer for brokers in highly competitive CRE markets. In the works for 2018, new products that use machine learning to create new offerings, including automated comps and ownership portfolios. Click here to find out more about Reonomy.